“Prove it” is pretty much the name of the game at this point. As SEOs, we invest so much effort into finding opportunities for our clients, executing strategies, and on the best days, getting the results we set out to achieve. That’s why it feels so deflating (not to mention mind-boggling) when, after all those increases in rankings, traffic, and conversions our work produced, our clients still aren’t satisfied. You don’t have to convince SEOs that their work is valuable. We know full well how our work benefits our clients’ websites. Our attention on crawling and indexing ensures that search engine bots crawl all our clients’ important pages, that they’re not wasting time on any unimportant pages, and that only the important, valuable pages are in the index. We spend our time improving speed, ensuring appropriate language targeting, looking into UX issues, ensuring accessibility, and more because we know the high price that Google places on the searcher experience. We research the words and phrases that our clients’ ideal customers use to search for solutions to their problems and help create content that satisfies those needs. In turn, Google rewards our clients with high rankings that capture clicks. Over time, this can lower our clients’ customer acquisition costs. Time spent on earning links for our clients earns them the authority needed to earn trust and perform well in search results. There are so many other SEO activities that drive real, measurable impact for our clients, even in a search landscape that is more crowded and getting less clicks than ever before. Despite those results, we’ll still fall short if we fail to connect the dots for our clients. Rankings, traffic, conversions… what’s missing? What’s a keyword ranking worth without clicks? What’s organic traffic worth without conversions? What are conversions worth without booking/signing the lead? Rankings, traffic, and conversions are all critical SEO metrics to track if you want to prove the success of your efforts, but they are all means to an end. At the end of the day, what your client truly cares about is their return on investment (ROI). In other words, if they can’t mentally make the connection between your SEO results and their revenue, then the client might not keep you around for long. From searcher to customer: I made this diagram for a past client to help demonstrate how they get revenue from SEO. If you want to help your clients get a clearer picture of the real value of your efforts, try some of the following methods. What’s the main action your client wants people to take on their website? This is usually something like a form fill, a phone call, or an on-site purchase (e-commerce). Knowing how your client uses their website to make money is key. Know what types of jobs/purchases your client is prioritizing so you can prioritize them too. It’s common for clients to want to balance their “cash flow” jobs (usually lower value but higher volume) with their “big time” jobs (higher value but lower volume). You can pay special attention to performance and conversions on these pages. How many of the leads your campaigns generate end up becoming customers? This will help you assign values to goals (tip #6). This can get tricky if your client offers different services that all have different values, but you can combine average customer value with close rate to come up with a monetary value to attach to goals (tip #6). 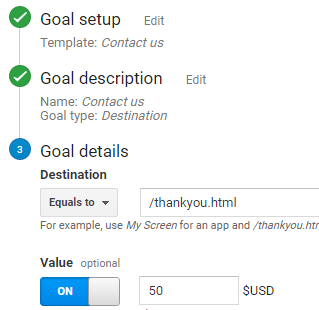 Once you know what constitutes a conversion on your client’s website (tip #1), you can set up a goal in Google Analytics. If you’re not sure how to do this, read up on Google’s documentation. Knowing that the organic channel led to a conversion is great, but knowing the estimated value of that conversion is even better! For example, if you know that your client closes 10% of the leads that come through contact forms, and the average value of their customers is $500, you could assign a value of $50 per goal completion. 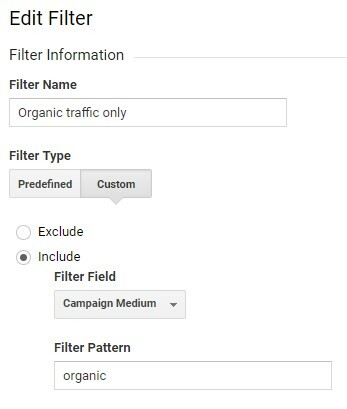 For the purpose of clarity, it could be valuable to set up an additional Google Analytics view just for your client’s organic traffic. That way, when you’re looking at your goal report, you know you’re checking organic conversions and value only. I like to use the Keywords Everywhere plugin when viewing Google Search Console performance reports because it adds a cost per click (CPC) column next to your clicks column. This screenshot is from a personal blog website that I admittedly don’t do much with, hence the scant metrics, but you can see how easy this makes it to calculate how much you would have had to pay for the clicks you got your client for “free” (organically). Organic has value beyond last-click! Even when it’s not the channel your client’s customer came through, organic may have assisted in that conversion. 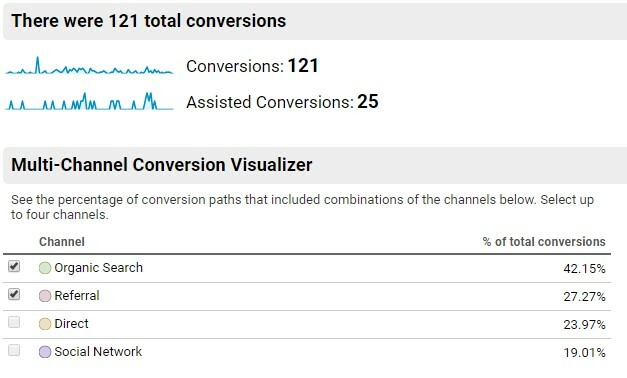 Go to Google Analytics > Conversions > Multi-Channel Funnels. How you communicate all this data is just as important as the data itself. Use smart visualizations and helpful explanations to drive home the impact your work had on your client’s bottom line. And let’s not forget, we’re in this together! If you have any tips for showing your value to your SEO clients, share them in the comments below.